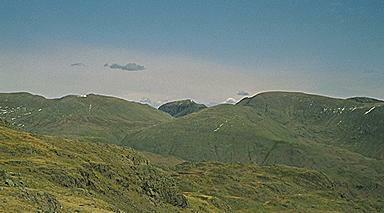 St. Sunday Crag appears in the middle of the picture through the gap of Grisedale Hause. To the left of it lie Dollywagon and Nethermost Pikes leading up to Helvellyn. From the right are Great Rigg and Fairfield with Cofa Pike appearing to the latter's left and Seat Sandal just in front. In the foreground is the ridge rising to Codale Head off the picture on the left.